In today’s digital Internet world, Every business is moving up their own business on the web. From small E-commerce to the big companies every business want’s to get found online when customers get search on the web especially on the Search Engine’s like on Google, Bing, and Yahoo. So for that perspective, every business creates a website where they list and describe their business services, goals and location where they have located all information on the website. Because the website is the great way to show your business online as per today’s digital age. But, there is one problem how your website will get found by the customers on the web especially in Search Engine results. Because around 70% of online traffic comes from these search engines. And Google and Bing are the only two search engines which are most widely used around the Globe. And for this, you need to do Search Engine Optimization on your website. So, in this post, you will learn 5 easiest way to get found your website on the search engine’s like Google, Bing etc. 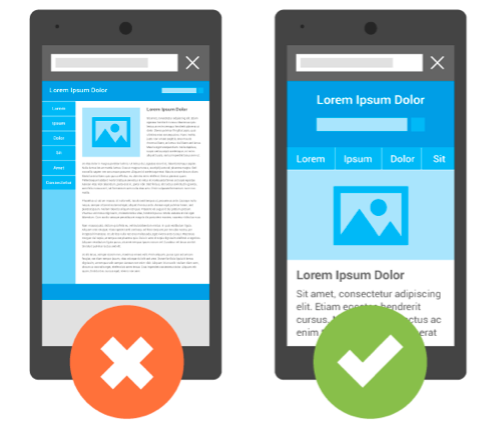 Having a mobile-friendly website is a critical part of your online presence. If you have a website which is not Mobile responsive then your website is outdated as per today’s digital age. In many countries, smartphone traffic now exceeds desktop traffic. 80% of internet users have smartphones and they use daily for web access. So, make sure if your site is not mobile friendly and responsive design then nobody will come up to your website. You can test your website here at Google’s Mobile-Friendly Test. So, what would someone search for to find your business? Have you ever think that what would people search your business online for finding your business website? That’s the question you must answer and that is what companies pay SEOs to find out. People search about business, services and other information by typing some relevant keywords which specify your website. Keywords are the Set of Strings that are used by the users who are looking for them. They search for products and/or services they know they need. Or, if they don’t know what they need, they search for the problem or challenge they actually have. SEO begins with identifying your target keywords. In other words, what keywords do you want to rank for? Keywords are valuable for your website. Some keywords are more important than others. Start with your primary keywords. All of your on-page SEO will rely on your keyword research. It is very important that you come up with a long list of target keywords for your website. For researching new keywords for your website always prefer Google Keyword Planner which is the best one for researching new keywords. Search engines — The page title is the first thing people see when they find your website through an online search. People — The right page title will entice people to click through to your website. Keep the page title under 60 characters. If your page title is longer, the search engines will only display a partial page title. Start your page title with your target keyword. Forgetting found in Search Engine Results, your website’s each webpage must have title, Keywords, and Descriptions. And this section is most important for search engine optimization aspects, that’s why they are important. The meta description tag in HTML is the 230 characters snippet used to summarize a web page’s content. Search engines sometimes use these snippets in search results to let visitors know what a page is about before they click on it. Meta Keywords are a specific type of meta tag that appears in the HTML code of a Web page and help tell search engines what the topic of the page is. By 2018, Google will begin utilizing security as an estimation of a site’s believable. I will let you know as a matter of fact that getting an SSL endorsement isn’t hard, yet it is difficult. Furthermore, in case you’re not particularly educated, I wouldn’t encourage you to do it without anyone’s help. Be that as it may, you can utilize an administration like Cloudflare or Let’s Encrypt to get a briefly shared SSL declaration for nothing. Be that as it may, I would suggest you really get one. A shabby SSL endorsement can cost as meager as $12. Most facilitating organizations will offer them for in any event $40 or $50 per declaration per URL you have. Since the hurry to get an SSL is still so new, I can’t reveal to you what the long haul consequences are of snatching one of the less expensive ones. Along these lines, I would suggest getting your site facilitating organization on the telephone and asking them what you have to do. Whether you have a blog or you offer products and services or work with a network marketing company, get your business listed in the directories. Add your company, your contact information, product descriptions, ownership info, and any other information needed to online directories. This includes blog directories if you have a blog, or if you have a business list your company with JustDial, Indiamart, Hot Frog, FourSquare, and any other credible citation directory out there. The more place you can put your company, the better. And the crowning jewel, of course, is listing your business on Google. Google verifies businesses with postcards. So, once you apply for a Google Business listing, Google will send you a postcard in the mail that contains a code. Use that code to verify your listing and you can be listed online. Keep in mind, though, if you run a home-based business that’s the address that Google will use and there will be a picture of your house showing up on Google Maps along with your business name. Search Engine Submission is the process of notifying search engines of the existence of website content so that they include the site in their indices and search results. Search Engine Submission is only necessary if the site has not been found by the major search engines. So, implementing all above tasks you can easily get on the top of Google Search Organic Results.